Todd Hamson has written a unique book from the Pre-Trib perspective. 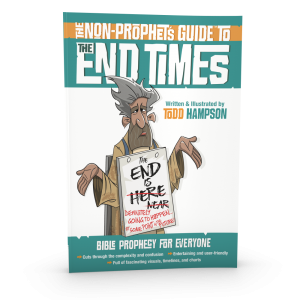 The Non-Prophet’s Guide™ to the End-Times is a user-friendly visual guide, written from the pretribulational, premillennial, literal/futurist perspective, and designed to introduce Bible prophecy to a new generation in a fresh and relevant way. Full of easy-to-understand charts, illustrations, and comic strips featuring a character known as The Non-Prophet, this book will introduce many to Bible prophecy for the very first time. The Author says the following about his idea for the book. “The topic of Christ’s return has been hijacked by caricatured notions of what the Bible actually teaches. I hope to demonstrate through this book that studying eschatology and Bible prophecy is a thousand times more relevant and practical than many Christians realize. Also, the world is a scary place right now, and many people are wondering what is going on. Those who don’t know bible prophecy are fearful, confused, and vulnerable to deception. This book will answer those end-time questions and more. My goal is to make complex things simple and move readers from a state of ambiguity and confusion to one of courage and clarity. After people read this book, my hope is that they will walk away with a firm understanding of key end-time events, see that the book of Revelation can actually be understood, and have an ability to recognize the biblical signs that help us understand our times. Todd Hamson adds that although The Non-Prophet’s Guide™ to the End-Times is designed to introduce Bible prophecy to everyone, he believes that part of his calling is to help Millennials and Generation Z rediscover the core 1/3rd of Scripture. The book has the endorsement of trusted authors and speakers such as Ron Rhodes, Mark Hitchcock, Jeff Kinley, and yours truly—Terry James. This book is one I can recommend for anyone desiring to get a grip on Bible prophecy. Also, it is a resource that will make a highly useful and spiritually productive gift for family and friends who will benefit from getting deeper into God’s Word. It should be especially appealing to those of the younger generation.